This book contains an in depth study of cases of cures which border on the miraculous for modern man though in all the traditions of religion, prayer is the central core of spiritual life and cure. To dismiss it as placebo effect is to overlook the inherent power in human body to fight a disease or a handicap partially or fully which may get aroused in some way or the other, one of the ways, well known ways being the prayer. An astrologer should not take the foolhardy step of suggesting to his client that he should stop giving medicines to a patient. I am aware of instances when it was suggested and the patients died miserable death when they gave up taking allopathic medicines which were keeping them alive, and controlling their ailments. Much worse is to suggest to give up well known scientific medical treatment and try the treatment of a quack. For instance a diabetic patient taking insulin injection twice a day was asked to try an ayurvedic alternative medicine which was not tested clinically and stop taking insulin. He died within two days after collapsing. The astrologer is not a doctor. He should keep himself within the limits of his own vidya and not pose as a miracle worker. What Maharshi Parashara has suggested is some stotra recitation, charity etc. In any scheme of faith cure, prayer to God is primary. It should be done according to the religion one belongs to. Muslims. Christians, Sikhs, Buddhists, jains etc. have been known to do it and some of them who have done it sincerely, with deep faith, have stories of fully successful or half successful cures to report. These claims should be closely examined astrologically by an astrologer and medically by a doctor. It is a double explanation of such phenemena that will restore faith or keep intact a belief in a good system of medicine and prayer-BOTH. The astrologer is aware of Prarabdha in human life and knows that in some cases nothing can be done. Doctors generally keep treating a patient even when they know it to be a case without any hope because they have to, because they are paid for it or because they are greedy and do not want to lose the money they get for it. Astrologers also prescribe very costly remedies and keep exploiting their clients. The cheating done by astrologers who prescribe costly jewels, diamonds, rubies etc as remedies and get their commission from jewellers is well known in the country. How many know the cheating done by karmakandi pandits in a similar fashion? The cheating done by karmakandhi pandits has reached a terrible level. In the case of people who have no children or in the case of other troubles they demand huge amount of money for shenti mainly because they as astrologers just do not know what to see and predict. There are cases after cases when they demand huge amount of money ranging from twenty thousand to fifty thousand or even more. There are cases after cases, when these karmakandi pandits have got done shantis for the fraudulent yoga called Kaal Sarpa Yoga and even have invented a half Kaal Sarpa Yoga to make money. If a doctor cheats you can go to a consumer court and claim damages if you have proof in the shape of medical prescription and treatment. How will you get punished a fraudulent astrologer? Keep proof of such cheating and go to the consumer court to put an end effectively to such cheating. But then it will not solve your problem. What is the answer? Surrender to the Lord in whatever form you worship him, whether you are a Hindu, Muslim, Christian. Sikh. Buddhist, Jain or of any other religion, BELIEVE IN PRAYER TO GOD AND SURRENDER TO HIM. The answer is mostly yes, if you pray honestly and lead an honest life. There are cases when nothing worked, there are cases where it worked partly and there are cases where it worked like a miracle. The cases given here are authentic, verifiable and the purpose of it is to tell you that man caught between two superstitions, of dogmatic religion and the other of SCIENTISM, is confused. It is better to try the well known spiritual method, remedy of honest prayer and increase your T APOBALAM. 1. If the patient can pray himself it is best as I did in 2000 when doctors in Delhi and Lucknow said that I would never be able to walk again. I took no medicines. I did my japam, Vishnu Sahastranam, Narayana Kavacham and did some exercises. In two years I was able to walk without a walker, climb stairs both in my own house and the Bharatiya Vidya Bhawan. 2. If the patient is unable to pray himself as happens in some cases, someone in the family who loves him and who is interested in his getting cured, SINCERELY, should do it. 3. There are cases when the entire family prays and what happened after that is described as a miracle by all. 4. In some cases where a karmakandi pandit is asked to do it. Make sure that the pandit knows karmakanda properly and is pure, spiritually disciplined and not greedy. These days, it is like asking for the IMPOSSIBLE. 5. There are cases where Mahatmas have showered their grace on a patient and cured him or her. These are rare but very amazing. In short, what is being suggested through these case studies is-never stop praying whatever the circumstance. These are some instances which cannot be explained easily as anything other than some energy or power in a person which seems to spring from within and cures what was otherwise incurable. Let me cite two instances. During the terrible Gujarat earthquake of 26 January of 2001 a case was reported of an invalid girl who could not walk because of some physical invalidation inspite of best medical treatment. Suddenly when the quake occured and everyone in the family run out. She house, she had the strong desire to save herself and some energy from inside her gave her the power to get up from the bed and run out. She has been a normal person since then. My own sister-in-law who, after a vehicular accident in 1986, had her back injured and could not walk was asked by doctors to remain confined to bed for some months. One day, when she saw her two small children struggling to get ready for their school, a strong maternal sense in her to be helpful to her children gave her the energy to spring up from bed at once and she has had no recurrence of that trouble for twenty years now. I have seen other instances, though very rare, of such cures which do not fall under the placebo category by any stretch of imagination no doctor administered any medicine here. All this happened suddenly. Similarly, where some cure has taken place over a period of time when another prayed and the son got cured what is the element of placebo? In most of such cases, it is an intense desire within that seems to work more in a patient but when someone else prays somewhere what is the element of placebo? I am not competent to go into this controversy or even talk of the opposite of placebo which is called nocebo effect. But prayers working is what I have seen in the cases of men with strong faith in God. 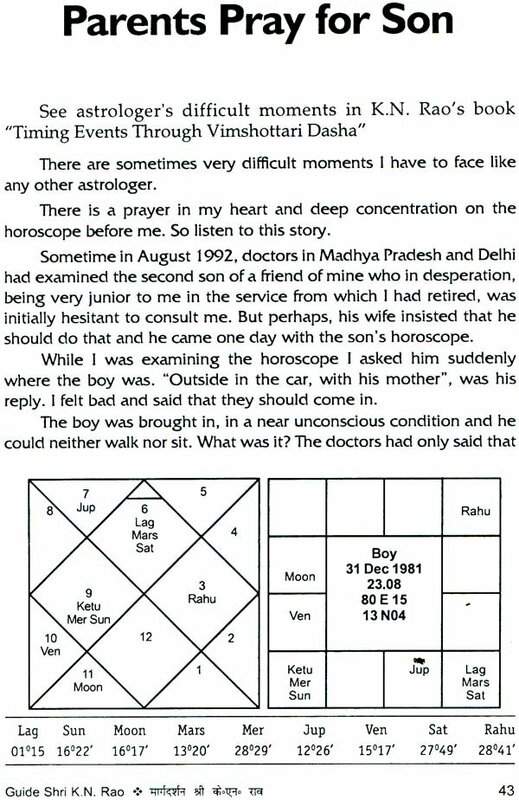 I have seen such cases in thousands from the age of eight (I am seventy five years old now when this book is being written) which I have studied astrologically and have watched most closely. But being in a government job for thirty three years with an all-lndia transfer liability indirectly I got feedback in some cases and therefore I decided not to include those cases in this book. 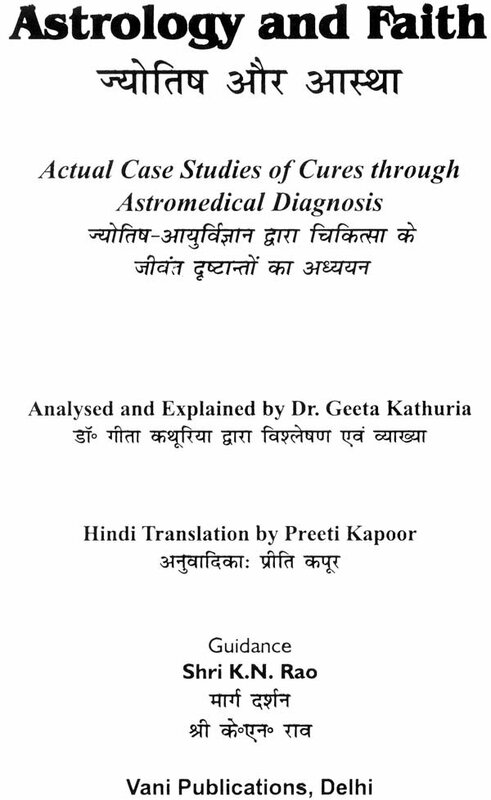 I asked Dr. Geeta, a medical doctor who is also a jyotish Acharya and who has personally known such cases, seen them herself and has verified some, to collect them and explain them astrologically and also medically. I must sound a warning here. Some westerners, particularly Americans have learnt from Indians the cheating tricks of Indian astrologers and have started making money in the name of remedial measures. 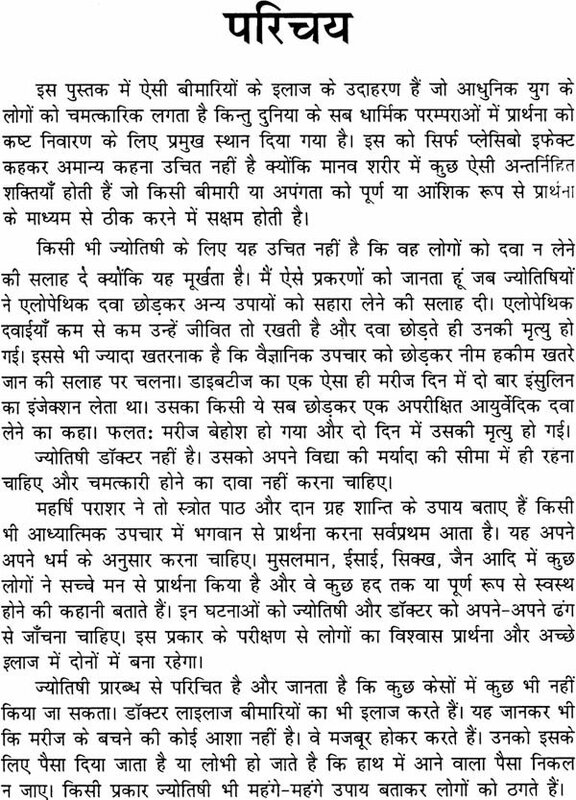 It has grown over a period of time and will not stop unless these fraudulent astrologers are tried legally. This is therefore the first book of its kind ever being written in the world.